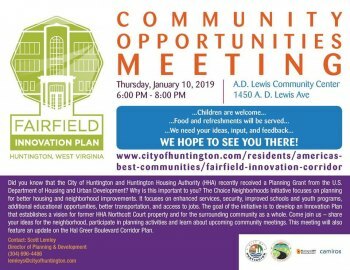 The public is invited to a community meeting from 6 to 8 p.m. Thursday, Jan. 10, at the A.D. Lewis Community Center, 1650 A.D. Lewis Ave., to give feedback on planning for better housing and neighborhood improvements in Fairfield. 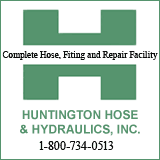 The City of Huntington and the Huntington Housing Authority recently received a planning grant from the U.S. Department of Housing and Urban Development? Why is this important to you? The Choice Neighborhoods Initiative focuses on planning for better housing and neighborhood improvements. It focuses on enhanced services, security, improved schools and youth programs, additional educational opportunitites, better transportation, and access to jobs. The goal of the initiative is to develop an innovation plan that establishes a vision for the former Northcott Court property along Hal Greer Boulevard and for the surrounding community as a whole. The meeting will also feature an update on the Hal Greer Boulevard Corridor Plan. For more information, contact City of Huntington Development and Planning Director Scott Lemley at 304-696-4486, email lemleys@cityofhuntington.com or visit www.cityofhuntington.com/residents/americas-best-communities/fairfield-innovation-corridor.